Use the mouse to move left and right. 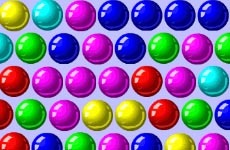 Bounce the falling balls to the side of their color. Grey balls can go to any side. When the ball hits the ground or the wrong side, you will lose a life. Earn points for the use of your skills. The higher levels of the game have many more features that make the game even more exciting.